How would creatives identify the heart of their neighborhood? With a central square surrounded (or filled completely) with casual dining tables, served by cafes and restaurants – the outdoor cafe square. Again, this is not an experience reserved for warmer climates – the scene above is from Amsterdam, which happens to be north of London, and certainly colder than New York City and Seattle. 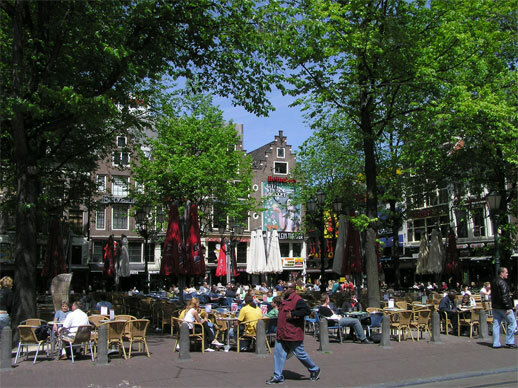 – Pedestrian-only (preferred) or narrow driving lanes just outside of the seating areas fronting the dining establishments that border the square. – Because these squares are at the neighborhood scale, the buildings are much more human-scaled, and ideally individually detached rather than mid-rise blocks. – Local, independent businesses, especially third places, for the same reasons above. – Shading trees are very common.